Vigils were held Sunday for victims of the mass shooting at the Henry Pratt Co. facility in Aurora. 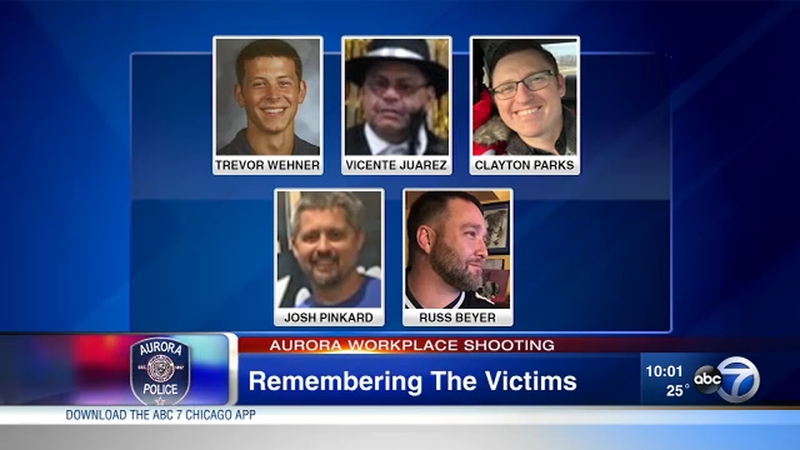 AURORA, Ill. (WLS) -- All five of the victims of a mass shooting at an Aurora manufacturing plant were identified Saturday, and it was revealed that the gunman illegally had a gun and had just been fired before he started shooting. The shooting occurred Friday afternoon at Henry Pratt Company and injured at least 11 people, including five Aurora police officers. Meanwhile, a vigil was scheduled for 2:30 p.m. Saturday for the victims at the manufacturing plant. The victims were identified as Clayton Parks of Elgin, Trevor Wehner of DeKalb, Russell Beyer of Yorkville, Vincente Juarez of Oswego and Josh Pinkard of Oswego, the Aurora Police chief said during a Saturday morning press conference. Five employees were fatally shot when a gunman opened fire Friday inside a sprawling manufacturing warehouse in Aurora, Illinois. All of the civilian victims were employed by Henry Pratt. However, Wehner was an intern and a student at Northern Illinois University. In a statement, the parent company of Henry Pratt released details about the victims. 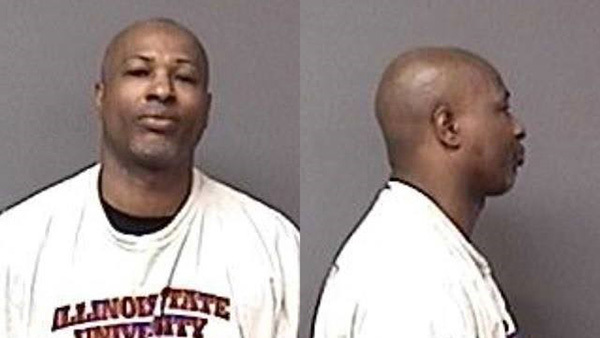 Gunman Gary Montez Martin, 45, of Aurora is also dead, police said. He was fatally shot by police at the scene, company officials said. He died of multiple gunshot wounds, according to the Kane County Coroner's Office. Five people were shot and killed in a mass shootign at an Aurora plant Friday. Martin has six prior arrests in Aurora, according to a statement issued by APD Saturday, "including arrests for traffic and domestic violence related issues." He was most recently arrested in 2017 by the Oswego Police Department for Disorderly Conduct and Criminal Damage to Property, the APD statement said. Martin had also been convicted of felony Aggrevated Assault in Mississippi in 1995, a charge that appeared when he applied for a Concealed Carry permit but may not have appeared when he applied for and was given a FOID card in 2014. His FOID card was later revoked because of this felony conviction. There was a large law enforcement presence at Martin's apartment as investigators try to determine his motive and whether any part of this attack may have been planned. SWAT teams and a bomb squad swarmed the parking lot of the otherwise nondescript apartment complex. Technicians worked with a robot, sending it into the gunman's apartment to look for anything, perhaps hazardous, that might give them a clue as to what led up to the shooting. Investigators are trying to piece together a clearer picture of who Martin was. Aurora police said officers first responded to the Henry Pratt Company in the 400-block of South Highland Avenue just before 1:30 p.m. Police said two of the four first officers on the scene were fired upon immediately. More officers arrived as backup and were also fired upon. ATF and FBI agents responded to the scene at approximately 2:37 p.m.
Police said five officers were shot and injured. They are in stable condition Friday night, officials said. Police said they found five civilians dead inside the building. A SWAT force entered the 29,000 square foot building and found Martin. Police said the officers engaged Martin in gunfire and he was killed. It was not immediately clear if Martin was killed by a police bullet or his own gun. "There are no words for the kind of evil that robs our neighbors of their hopes, their dreams, their futures," said Governor JB Pritzker, who also attended a Friday press briefing. "Our hearts go out to the victims in this horrific tragedy. Our prayers to their families during what I'm sure will be a long and painful healing process. But we will heal. We will come together as one community and stand by those in pain from today's great loss. We will stand together with those officers shot in the line of duty. We will come together and heal as One Aurora," said Aurora Mayor Richard Irvin. Martin was a veteran assemblyman at the century-old valve plant. Law enforcement sources told the ABC7 I-Team he was summoned to a meeting room where he was told he was being fired. He responded with a pistol, opening fire on the executives in the room, and then took his anger to the plant floor where dozens of his coworkers were still on the lines. Investigators are combing the apartment of gunman Gary Martin, after he killed 5 people and injured at least 11 more, including 5 police officers, in a workplace shooting. "Next thing you know, he went walking back in front and we heard more shots and that's when we just left the building, and he started opening up on the room and he was just shooting everybody," said John Probst, witness and survivor, who has worked at the plant for 40 years. John Probst, who works at Henry Pratt Company, describes the shooting at his workplace in Aurora and how he escaped. There would have been approximately 30 people in the building at the time of the shooting, Probst said. Employees at Henry Pratt Company were kept in lockdown in another building until 8 p.m. Friday, when the facility was cleared by SWAT and K-9 teams. Employees at Henry Pratt were kept on lockdown in another building well into the evening, but were allowed to leave around 8 p.m. after every corner of the facility was deemed secure by heavily-armed SWAT teams and K-9 units. When they left, some carried their lunch cooler like any other day, and another employee carried Valentine's Day roses and a "happy birthday" gift bag. "It cuts really deep, really deep. I have no words to express it, what the families are going through or what the officers are going through," said Rhonda Morris, who lives nearby. Mueller Water Products is shocked and deeply saddened by the horrific tragedy that occurred today at our Henry Pratt facility in Aurora, Illinois. Our hearts are with the victims and their loved ones, the first responders, the Aurora community and the entire Mueller family during this extremely difficult time. Our entire focus is on the health and well-being of our colleagues, and we are committed to providing any and all support to them and their families. We continue to work closely with law enforcement, with whom we share our deepest gratitude for their support. We will provide updates as we learn more. The Henry Pratt Company is located amongst residences in Aurora, and the people who live near the plant were shaken by Friday's mass shooting. The sound of gunfire and police sirens had neighbors too scared to go outside of their homes for most of the afternoon. "It sounded like a machine gun," said a neighbor named Maria. Residents were told to stay away from the active scene. "Me and my husband were coming back from the store and I saw the first squad car pull up and then there were hundreds just going through my street. And I told my husband, I said, we have to go on lockdown," said Margie, neighbor. West Aurora Schools were on soft lockdown for several hours. The lockdown was lifted at about 3:30 p.m. and students were dismissed. Parents tried to locate their children at different dismissal points. Brianna, who attends West Aurora High School, worried for her safety. "They didn't tell us anything," she said. "They just said that it was not a drill and that we couldn't leave." The community is thankful for the first responders and heartbroken over the loss of the innocent victims. "I've never seen this before," Margie said. Probst said he and a coworker escaped through the back door. Probst said a nearby resident allowed Probst and his coworker to shelter in his home. Homeowner Gabriel lives behind the scene of the shooting in Aurora and describes how and why he let several survivors into his home after they escaped. "Every police officer dreads days like this one, yet these four courageous Aurora officers and their colleagues did not hesitate to literally put their lives on the line today to stop further bloodshed. These four heroes willingly ran into harm's way to protect their fellow citizens and very nearly paid the ultimate price. We Illinoisans should be humbly grateful for their sacrifice, and we ask that you join us in praying that the injured civilians and police officers make a full and speedy recovery."